Only a few years ago Permanent Beta was merely a brainwave stirring in the minds of threemen on a mountain top somewhere in Austria. Currently, in 2014, the movement, starting outin the Dutch city of Amersfoort, has begun to expand rapidly. Events such as the PermanentBeta Day attract dozens of speakers and hundreds of visitors. 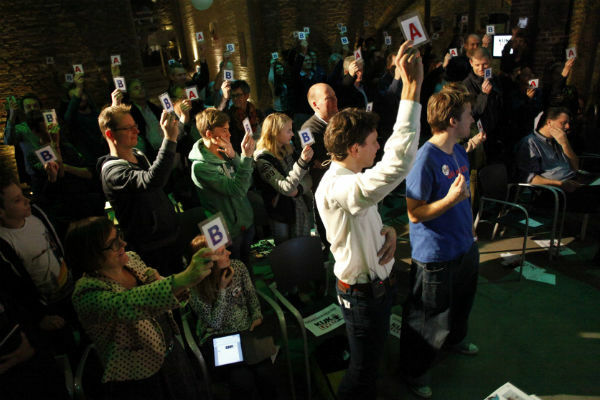 In Groningen, Enschede andRotterdam teams have popped up, eager to organise events adopting the Permanent Betaframework. But what exactly is this thing called Permanent Beta and what is its appeal? Andwhere is this thing going? Bridging Brains Tech and Culture’ is Permanent Beta’s slogan. The initiators are convinced that the most exciting developments in our society today come about when art, technology and science meet. This is where the creative and innovative ideas which contribute to solutions to every large issue of our time: education, healthcare, decentralising government or innovation, emerge. Permanent Beta aims to be the platform where all three disciplines meet. This wasn’t necessarily the ambition the three initiators of Permanent Beta had when they ﬁrst met, during an inspirational weekend in an Austrian mountain hut. Martijn Aslander, familiar as he is with the topic network society provided a training session there and afterwards got to talk with two creative entrepreneurs: Peter Ros and Jan-Henk Bouman. Aslander remarked that he had often noticed that many programmers create most of their really exciting stuﬀ oﬀ the job and not during work hours. He also made the observation that housing your enterprise can be quite inexpensive these days. So much oﬃce space is just sitting there empty and if you go about it the right way you’ll be able to obtain it for free, Aslander said. Ros and Bouman were triggered by this conversation and almost as soon as they returned home they rang Aslander.They had arranged for oﬃce space in the Chamber of Commerce building in Amersfoort. They felt that all of the outrageous plans they had come up with during their encounter in Austria ought to be put to practice. The three men soon agreed that their mutual project was going to be to create some sort of playground, where everything would revolve around creativity and innovation. Similar to what had been the objective previously ofJan Peter Balkenende’s (former prime-minister) Innovation Platform. This platform came to an end because of political and ﬁnancial reasons, but the principle behind it was sound. The Netherlands are a country without any natural resources, owing most of its wealth to the extraction of natural gas. But what will happen when we run out of gas? Creativity and innovation will replace natural gas as a resource. The Innovation Platform oﬀered another very important lesson: considering that an initiative such as this one may fall ﬂat as a result of changing political forces, or because someone decides to just pull the plug on it, it would be wise to construct a movement that is independent.It should operate like a network, a swarm that can not be deactivated by external forces. The solution came about in the form of Permanent Beta. The word beta is commonly associated with technology, or the beta subjects taught in schools. The meaning ofPermanent Beta however refers to a concept used in software. In that context ‘beta’ means that a certain application is fully ready for use, even though it is still being constructed. Gmail, for instance, the free email application by Google which remained in beta for years. It wasn’t fully developed, but it was made available to those users that saw its beneﬁts nonetheless, meanwhile enabling Google to learn from the way people used it in practice.This is why Aslander, Ros and Bouman adopted the notion that everything in this digital world should remain in Permanent Beta. Changes come about so rapidly that there simply is no time to create permanent solutions. And this is not a bad thing. We are going to have to get used to taking care of business by applying solutions that are, by deﬁnition, of a temporary nature. Ours is the era of the lean startup, getting started with a minimum viable product and learning as you go along. This already is the approach used by most tech-companies in Silicon Valley. Flaws tend to reveal themselves much earlier in the process and can be remedied in an earlier stage.If governments would also adopt this approach the vain spending of millions of euros on large it-projects would be prevented. Aslander, Ros and Bouman came up with a number of rules for the platform. Permanent Beta provides a physical location, where people that are looking to share for sharing’s sake, meet. Not because they want something in return. Permanent beta aims to organise meetings and events to allow the participants to meet in real life and share their knowledge and insights in a setting where there’s neither a threshold nor any pretences. Admission to meetings is always free and they’re accessible to anyone. Participants pay for their own food and drinks so there is no overhead. 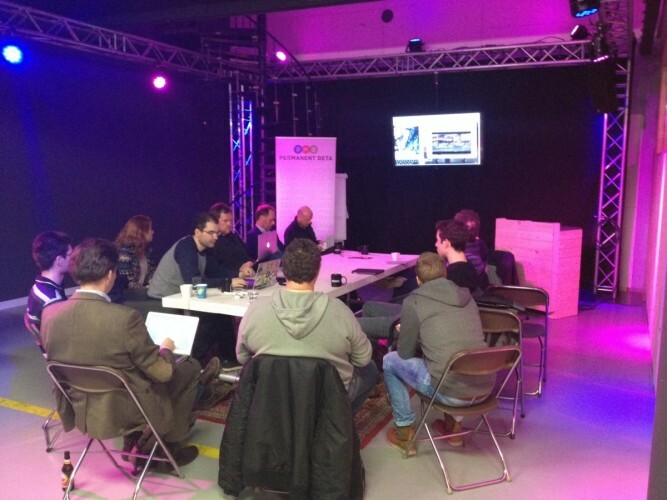 Meetings are cleverly organised via Meetup.com and they always take place as planned. They never get cancelled. The amount of success isn’t measured in numbers of participants. The speakers, who aren’t paid for their talks either, decide for themselves on the subject they want to talk about. They can even change the subject as they go along, whenever they see ﬁt. If anyone in the room feels like he’d really like the group to engage in a brainstorm on the subject of Evernote for instance, they’re completely free to instigate that. Because of the utter looseness of the meetings everything feels like it’s part of a mutual experiment: everyone is just tinkering. Permanent Beta started out with meetings focusing on all sorts of subjects: quantiﬁed self, singularity, life hacking, working smarter, education, rethinking city improvement, sustainability, drones, biohacking – all of which are subjects the organisers knew people were curious to learn about. This means that at one occasion someone is speaking about his vision on future education and on the next the stage may be taken by the inventor of the majorana particle, a potential Nobel Prize winner. One person speaks about the chip he had implanted in his body (which Aslander himself has had done) and another person may be sharing stuﬀ about his new drone which ﬂies up to a height of 180 metres. The approach is not to thematically organise subjects, but they always have one thing in common, which is: Permanent Beta, Bridging Brains Tech and Culture.All kinds of people are attracted to these meetings: army personnel, education professionals, people who work in health care, tax authority professionals, people wanting to just get involved, curious people fascinated by the explosion of possibilities generated by new technologies that have become available to us. These developments are getting more and more exciting. The success of these more or less separate meetings has made the initiators –joined meanwhile by kindred spirits tuning into the movement- decided to organise an actual Permanent Beta day. Over time the organisation has developed such a large and interesting network, that it turned out that they were able to gather about 50 interesting speakers, with neither a lot of eﬀort nor any budget. Around three hundred people participated in this event. Sandwiches were sold outside to those who had gotten hungry. The event was free of charge but lunch wasn’t. Everyone completely understood this, since it enabled Permanent Beta to organise the event without taking any ﬁnancial risks. Because of the large number of people interested to attend it started at 10 o’clock in the morning and went on until 10 o’clock at night. During the day ﬁve to ten programme items were taking place simultaneously. There was no evaluation form to ﬁll out afterwards as is customary at other seminars or conventions. Either you should have made better choices regarding the items you attended or next time host your own event. 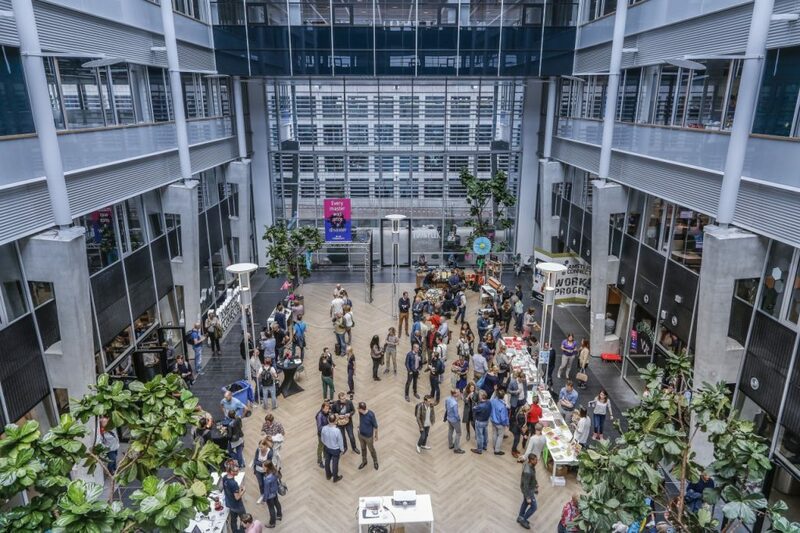 Half an oﬃce ﬂoor in the Chamber of Commerce building soon became the whole building and not much later Permanent Beta chose ‘de Nieuwe Stad’, an urban innovation project in the former Prodent factory in Amersfoort, as its location for the next Permanent Beta day. The organisers also forged an alliance with Felix Lepoutre, who is the host of the meet&workspace in the Amsterdam Beurs van Berlage. He invited them to come over and check out Amsterdam. This resulted in a monthly event in collaboration with KIJK, the magazine to which all 40.000 nerds of the Netherlands were subscribed as kids. The publishers of this Magazine, Sanoma, were surprised that it turned out to be possible to host an event (KIJK Live) at one of the most desirable locations of the Netherlands, without any expenses. These events are broadcasted via live stream, which has hugely promoted the enthusiasm for Permanent Beta, so it has grown since. Visitors are thrilled to see their favourite magazine come to life and speakers and editors are very keen to actually meet their readers. Since then Permanent Beta has formed an alliance with Tegenlicht, a television show that features developments in politics, economy, sociology and science. Two days after an episode has been aired, Permanent Beta sets up a meeting in which the subject is further explored and discussed by experts and people who are interested entering the discussion making an argument either for or against the subject at hand. Since Permanent Beta started out two years ago it has spread like a virus to cities such as Groningen, , Rotterdam, Enschede, Utrecht, Assen Eindhoven and Amsterdam. Permanent Beta acts as a network, a movement or a swarm. It explicitly refuses to be a political platform. Permanent Beta is deﬁnately similar to the open access movement for example, but it is most of all a place where people come together to exchange knowledge.The people attracted to Permanent Beta can be divided into two groups: digital avant-garde and social pioneers. Both groups consist of people who are involved in social innovation: they don’t just look at technology but also search for ways in which technology enriches people’s lives. This is where they ﬁnd their common ground. They all realise that we are currently going through a new Renaissance, as Aslander identiﬁed it. We are converging towards a network- and innovation society, characterised by numerous disruptive innovations. Artists such as Daan Roosegaarde are inspired by these developments. But the ideas these artists come up with also need to be executed, of course. This is where the digital pioneers come in. They play a huge role in the community. This is emphasised by the fact that online medium Webwereld by IDG Publishers has joined the platform. Webwereld is interested in the content that Permanent Beta generates and has access to the channels that are needed for spreading it. The success of Permanent Beta has not gone unnoticed. Various players are connecting to the concept and the organisation stays true to its principles: there is no place for money in Permanent Beta. Should you allow for money to play any part in the organisation you would be forced to stop when funds fail to come in. However, it is possible for organisations to back Permanent Beta by oﬀering a contribution to cover expenses. Expenses are inevitable. Think about acquiring the necessary technology to organise the meetings or expenses that are made to spread new technologies to all parties involved. The more backing Permanent Beta receives from enthusiastic followers, the more the platform is able to achieve. But that’s the only beneﬁt enjoyed. The movement doesn’t engage in any sort of sponsor deal since this would imply that companies can start sticking their logo on things. This is simply not an option, not even if some company came along oﬀering 200,000 euros. Permanent Beta is neither for sale nor for hire. The network is willing to cooperate, but only if its conditions are respected. If, for instance, a telecom company would come knocking on the door Permanent Beta would absolutely be willing to organise a meeting, but only if competing organisations are allowed to be involved. Only then a Permanent Beta meeting can make a diﬀerence on a larger scale and beneﬁt the world. As far as making the world a better place is concerned the Netherlands can play a very relevant part in that, that is what the initiators of Permanent Beta are convinced of. The Netherlands aren’t burdened by any barriers in terms of language or religion. The power gap is relatively small and interconnectivity is more highly developed than anywhere else in the world. The Dutch are strong team players and have always been early adopters to new technologies. This makes the Netherlands perhaps more likely than most other countries to beneﬁt from the convergence of exponentially developing technology, like the ﬁrst 3D printed skull implanted in a person in the UMC in Utrecht, for instance. In this already advantageous climate Permanent Beta functions as a catalyst, where particles of knowledge are free to collide and interact. Permanent Beta is building bridges, allowing people from all sorts of backgrounds and with a variety of talents to inspire each other and exchange knowledge. And this is simply a good idea, because the best solutions for one discipline are often found in the realm of another discipline.